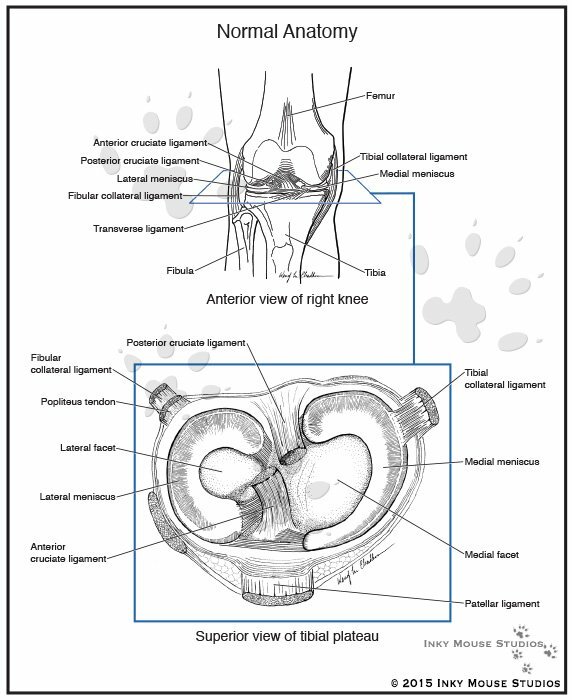 This is a simple illustration of the anterior view of the human knee showing the normal anatomy which would be suitable for patient education or textbook use, and is used to help orient the viewer to where the view of the superior view of the normal tibial plateau is based in relation to the entire joint. This is a simple pen and ink illustration of the superior view of the normal tibial plateau anatomy which would be suitable for patient education or textbook use and pairs well with the accompanying set of illustrations which illustrate the six most common meniscal tears in sports injuries. There is a corresponding chart of the six common meniscal tears which viewers can compare to the normal anatomy shown here.